Broken up in five sections from 2000-2015, this often hilarious, sometimes horrifying, and poignant story follows a genre filmmaker’s journey through film production, home video distribution & marketing, and how the biggest video store chain on the planet operated at store levels and within the independent film market up until its global downfall — much to the detriment of many professional independent filmmakers and distributors. A one-of-a-kind snapshot of an iconic era in video and cinema. “Every filmmaker should read this book — it was hilarious, poignant, and horrifying.” -UBC Cinema Studies department. “It absolutely spoke to me. 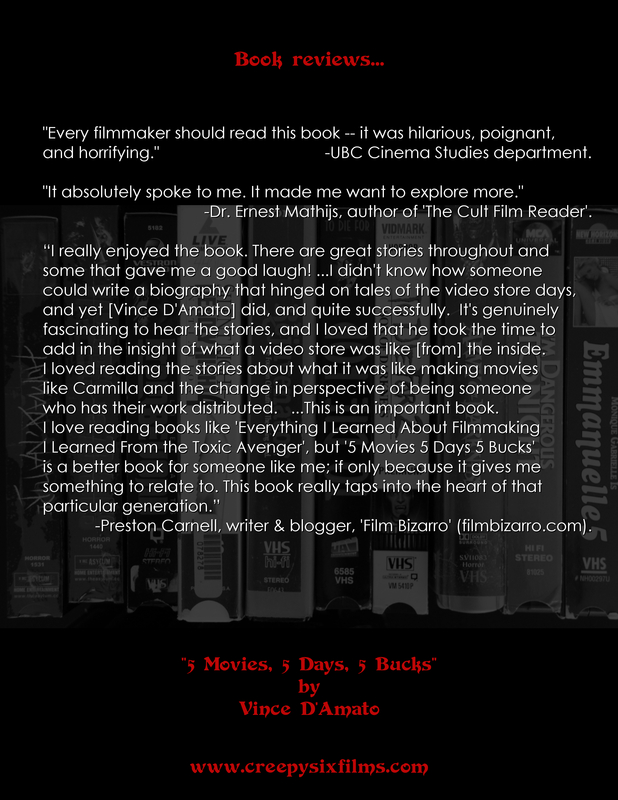 It made me want to explore more.” -Dr. Ernest Mathijs, author of ‘The Cult Film Reader’. “I really enjoyed the book. There are great stories throughout and some that gave me a good laugh! …I didn’t know how someone could write a biography that hinged on tales of the video store days, and yet [Vince D’Amato] did, and quite successfully. It’s genuinely fascinating to hear the stories, and I loved that he took the time to add in the insight of what a video store was like [from] the inside. I loved reading the stories about what it was like making movies like Carmilla and the change in perspective of being someone who has their work distributed. …This is an important book. 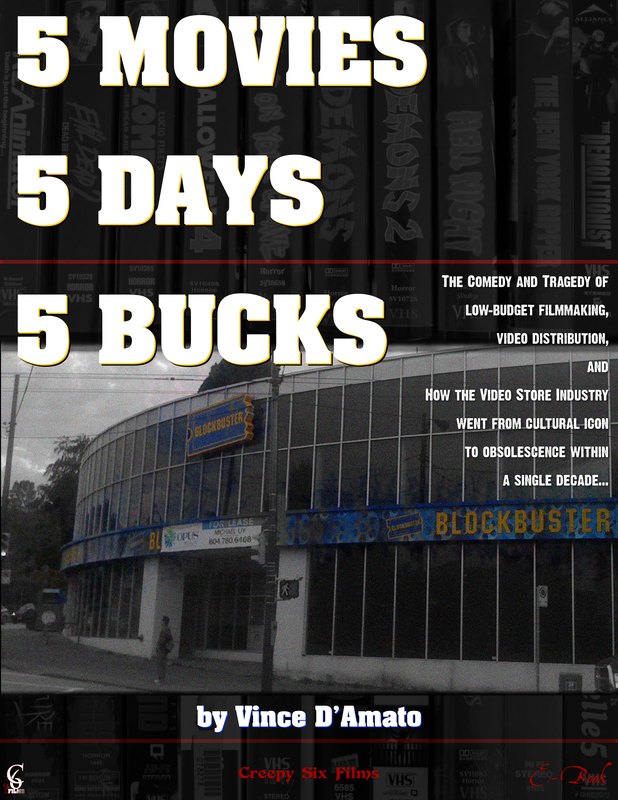 I love reading books like ‘Everything I Learned About Filmmaking I Learned From the Toxic Avenger’, but ‘5 Movies 5 Days 5 Bucks’ is a better book for someone like me; if only because it gives me something to relate to. This book really taps into the heart of that particular generation.” -Preston Carnell, writer & blogger, ‘Film Bizarro’ (filmbizarro.com). COMING SOON: “FROM BEYOND” –– The wild films of Stuart Gordon, Jackie Kong, and Brian Yuzna and the Vestron Video era that launched them all.